The fifty-seven year history of recorded blues has witnessed many great partnerships; Leroy Carr and Scrapper Blackwell, Sleepy John Estes and Hammie Nixon, Georgia Tom and Tampa Red, Big Bill Broonzy and Jazz Gillum: men who were so intuitively aware of one another's musical needs that they were not only the perfect team, but also created a complete fusion of feeling in their music. More contemporary examples have been Muddy Waters and Little Walter or Buddy Guy and Junior Wells but, famous as all these were, none have been more enduringly consistent, or given as much pleasure to so many, as have Sonny Terry and Brownie McGhee during their forty year partnership. The elder of the two, Sonny Terry, was born in Greenboro, Georgia on October 24, 1911, and was christened Saunders Terrell. When he was six his family moved to Rockingham, North Carolina where, at the age of eleven, he lost an eye during a children's game. Five years later he was blinded in the other eye when a lump of iron was hurled at his face. This total blindness, coming as it did at a very impressionable age, caused him to become withdrawn, taking solace in "mocking" train and animal sounds on the cheap harmonica which he had learned to play as a child. During his late teens Sonny moved to the tobacco town of Durham, North Carolina, to stay with a blind guitarist friend whom he'd met many years earlier in Rockingham. This guitarist was Fulton Allen, better known to most by his recording name of Blind Boy Fuller. For many years the two men, together with a third, Blind Gary Davis, busked in the streets of Durham playing for (in Sonny's words) "some spending change" from the cigarette factory workers. In July 1935 both Fuller and Davis were signed to the American Recording Company (A.R.C.) by a local talent scout and were taken to New York for a recording session. On a return visit two years later Blind Boy Fuller took Sonny Terry with him. At least five of the eleven songs Fuller cut at that session were accompanied by Sonny's harmonica. From then on Terry went with Fuller to all his recording dates right up to, and including, Fuller's last of 1940. However, Sonny's own "big break" actually occurred in 1938 while he was a house guest of record scout J. B. Long. In 1938 John Hammond, the man responsible for Bessie Smith's return to record in 1933, paid a visit to Long's Burlington home on a talent finding trip, in company with the then president of Columbia Records, Goddard Lieberson. Sonny so impressed Hammond with his harmonica virtuosity that he was asked to appear at a gospel, jazz and blues concert to be held at New York's Carnegie Hall. That winter Terry, with washboard player George "Oh Red" Washington acting as his eyes, travelled north to his New York venue. On Christmas Eve 1938 the unknown Sonny Terry received rapturous applause from the capacity white audience with his almost unintelligible, whooping falsetto delivery of the archaic "Mountain Blues" and "The New John Henry", the sole accompaniment being his wailing harmonica and feet tapping out the rhythm. Big Bill Broonzy, who was also on the bill, was by comparison sophisticated! This success led to Sonny making his first commercial recordings under his own name (for Okeh Records) in March and June 1940. (He had previously been recorded by the Library of Congress but these were documentary rather than commercial recordings). That same year, again probably as a result of his Carnegie Hall appearance, he was given a "novelty" part in the Broadway show Finian's Rainbow. The parallel period in Brownie McGhee's early life was just as fraught but less eventful. A slightly younger man, Walter Brown McGhee, nicknamed "Brownie", was born in Knoxville, Tennessee on November 30, 1915. When he was four he suffered a polio attack which affected the growth of his right leg, leaving him with a permanent limp. As a result of this handicap, he too avoided playing with other children because he couldn't join in their games and found consolation in experimenting at culling tunes from fiddles and a home-made five string banjo. By the age of eight, Brownie had taught himself how to play his father's guitar and also the rudiments of the piano. Soon after the McGhee family moved to Lenoir City, Tennessee, where Brownie finished the primary education he'd begun in Knoxville, and played organ for the Solomon Temple Baptist Church. Before long the family moved again, this time to Marysville, Tennessee, where Brownie began high school, but his overwhelming desire to play music bested him, and in 1928 he left home, forsaking his studies for a minstrel's life. With his guitar on his back the young Brownie McGhee took to hoboing around Tennessee, finding work singing in beer taverns, roadhouses, medicine shows, mining camps, in fact anywhere music was in demand, playing blues for blacks and hillbilly music for whites. In the early thirties, Brownie's travels brought him full circle back to his parent's farm, helping on the land by day and singing with a local gospel quartet, The Golden Voices, at weekends. Some years later Brownie was on the move again (although he managed to graduate from high school in 1936). This time he moved back to Knoxville, where he formed a small group which included harmonica player Jordan Webb. The group didn't stay together long, and he and Webb crossed the state line into North Carolina, eventually ending up in Burlington where Webb introduced Brownie to Blind Boy Fuller's washboard player, the albino George "Oh Red" Washington. It was through Washington that Brownie gained an introduction to talent scout J. B. Long. The latter was greatly interested in the similarity of style between Brownie and Blind Boy Fuller, who at that time was in poor health. When it seemed clear that the then popular Fuller wasn't getting any better, Long recorded Brownie singing in a carbon-copy Blind Boy Fuller style. The following year (1941) Fuller died, and three months later Brownie was recalled to the Chicago studios to cut more records, including one called "The Death Of Blind Boy Fuller" which was issued as by "Blind Boy Fuller No. 2". On October 22, 1941, Brownie was back in Okeh's New York studios to record more blues and present in the studio at the same time, due to record after him, was Sonny Terry, an artist Brownie had briefly met in the late thirties through their mutual friendship with Blind Boy Fuller. Brownie had brought his own harmonica player Jordan Webb to the studio but nevertheless he invited Sonny to play second harmonica on one song, letting him take over the role completely on another. A permanent partnership began between the two men during 1942, when Brownie was asked by J. B. Long to act as Sonny's lead-boy on a trip both had to make between Durham and Washington DC in order to appear at a concert with the famous Huddie "Leadbelly" Leadbetter. So the paths of Sonny Terry and Brownie McGhee, as if predestined, crossed. The rest, as they say, is blues history. The two men have travelled together ever since, making innumerable records for Savoy, Alert, Capitol, Asch, Verve, Folkways, Prestige- Bluesville, Stinson, Elektra, Fantasy and A&M, to name but a few of their labels (!) They have accompanied artists as diverse as Woody Guthrie, Pete Seeger, Lightnin' Hopkins, Big Bill Broonzy and Champion Jack Dupree, as well as touring from coast to coast and nation to nation to appear in concert hall and club alike. The tours, which have taken them as far afield as India (sponsored by the U. S. Department of State) and Europe, have gained Sonny and Brownie the esteem of millions and have been directly responsible for the greater acceptance of the blues today. The duo, along with Josh White and Big Bill Broonzy, were instrumental in making the blues acceptable to British ears, first enthralling British audiences in May 1958 when they toured with Chris Barber's Jazz Band. In the succeeding nineteen years they have been back on countless occasions, each time playing more dates to bigger crowds. Today it's hard to believe that these two men, who are well into their sixties, and have been through a lifetime of hard travelling, still possess the same enthusiasm, energy and verve as they did forty years ago. Any scepticism is soon dispelled, as anyone who has seen them perform their one hour sets will aver. It might be assumed that Sonny and Brownie, as individuals, have much the same sort of personality after having been together so long, but in fact they are complete opposites, wherein might lie the answer to their lasting partnership. Brownie is short, velvet-toned, affable and extrovert, whilst Sonny is tall, has a voice of unexpected grittiness, and is silent in group conversation, speaking only when spoken to. Sonny's stage performance, however, belies this taciturn temperament; the exuberant whoops, the extrovert rotating of arms and fluttering of fingers as he plays his harmonica give no hint of his withdrawn nature. In concert, Sonny and Brownie prefer to perform standards like "Walk On", "Bad Blood", "Cornbread Peas And Black Molasses", "Twelve Gates To The City", "Key To The Highway" which their fans have come to love and expect, but the style in which they sing and play is still very much rooted in the Carolina blues tradition of their youth. 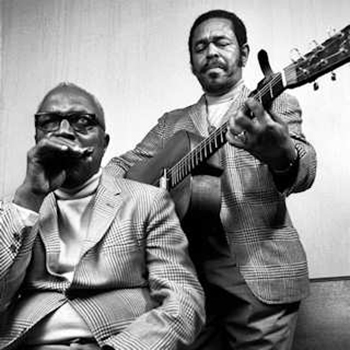 Sonny Terry and Brownie McGhee are two artists who live their music, travelling the world conveying their musical heritage, the blues, to people of different colours, creeds and cultures: a music which has been their lives for as long as either can remember. The last word on this remarkable duo should perhaps be left to them. In the words of one of their most popular duets, "I'm not ashamed, ain't that news, I'm living with the blues". Don't they just!